Players lay down wagers in the hope of winning big, which is where payouts come into the equation, as there is no excuse for an online casino not to put plenty of cash up for grabs. High payouts and fast cashout times are an important part of what makes an online casino great, and that's why it's vital you find an online casino offering fast payouts. Looking at how things currently stand, SlotoMania has ranked #1 for the fastest and best payouts in April 2019. But, this online casino doesn&apos;t stand alone, here we go into everything you need to know about online casino payout percentages and online gambling payout speeds. The best payout casinos are those that give players a fair degree of freedom with regards to how they play and how they can manage an account. Delivering not just a fast-paced and secure casino experience, but also plenty of choices when it comes to banking methods. Of course, when it comes to payout rates, it&apos;s fair to assume that the higher the percentage the better, but you can&apos;t discount the other elements that help make the best payout casinos what they are. The highest payout online casinos always show clearly on their site how much they've paid out recently, and that's great for players because it lets them know how generous a casino actually is. Beware though. Just because an internet casino payout percentage is really good, that doesn't mean you'll always get your money back every time you play. The payout percentage is based on an average of all the money the casino is paying out and not the amount they pay out on each game. It doesn't matter if the online casino payout percentages are really high at the US site you're playing at if it takes ages to actually collect the winnings you're owed. If a site manages to pay out quickly, it's a good indicator that the site is well managed and reputable because it shows a good amount of respect for players but also demonstrates that they know what they're doing. It's no wonder that the casinos with the best payouts are usually the most popular ones. If you find yourself waiting for ages and not getting the best payout speeds, then it might be time to make a move to another gambling site. That's because slow payouts are often an indicator that a company is struggling to make a profit and could possibly be facing financial difficulty. If you're even vaguely interested in winning, the best indicator of how often that happens on a particular site is to look at the total they've paid out. If it's low, chances are you might not be onto a bigger winner there. The old saying “don&apos;t put all your eggs in one basket” certainly applies when it comes to the world of online casino gaming. While it&apos;s great to feel settled at a certain online casino or when playing a certain game, you need to be willing to move onto something new, especially if that somewhere comes complete with a bumper payout percentage. In many ways, the same actually applies to games as well. From the tables to the reels you&apos;re going to find that the RTP percentages have the potential to swing wildly. Speaking about slot games, Goblin's Cave from Playtech has a sky-high 99.3% RTP, while Nemo&apos;s Voyage from William&apos;s Interactive only has a 95%. RTP stands for Return to Player percentage, with the term being used to describe the payout power of any particular online slots game. Set by the game provider, the percentage relates to the percentage of money wagered on a game against the amount paid back to players over a certain period of time. Goblin&apos;s Cave has a 99.3% RTP, which means that it is a more rewarding game than others, as it comes in higher than the 96% RTP industry average. This means that over the course of 1,000 plays – at $1 per play – the game should return $993 back to players. We should also make it aware that the RTP addresses the long-term average return, but this - of course - doesn&apos;t account for what could happen in the short term. As you can see, in just four steps you can easily cashout any winnings you may have! This is a great method for security. eChecks also provide the reliability of using a paper check with the speediness of using an electric payment that makes it one of the most popular online casino best payouts options. Wire transfers can take up to two days to deposit funds in your bank account, but they are very reliable and highly regarded among the best payouts. 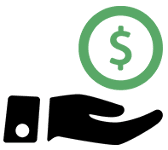 As long as you don't need the money instantly, wire transfers are one of the most solid online gambling payout methods. You gamble online in order to win money, so for all of the fun and fancy that casino games can provide, walking away with cold hard cash is always going to be the goal. With jackpots and payouts being in high demand, no player can ever discount the importance of high payout percentages and fast payout times. If you&apos;ve taken in all of the above, you&apos;ll now have an understanding of payout percentages, along with what exactly the best payout casinos are bringing to the table! You can always check what the payouts of any game are in the game's rules section or on the pay table page of slots games. What impacts the actual payout speed – as in the time between withdrawal request the money reaching your account – largely comes down to the admin side of matters on behalf of the casino. However, you can be sure that all of our recommended sites offer payout times of only a few days. A payout percentage is the amount of cash an online casino pays back to its players. For example, if a casino has a payout percentage of 92% it means that 92% of all the money wagered on that site goes back to players as winnings, while the casino keeps the other 8%. Will my banking method impact payout time? The payment method you use to deposit and withdraw cash from your casino account won't affect the chances of you winning, but it will make a difference to how fast your winnings will be transferred to your bank account. The best method to use for instant withdrawals is an eWallet. The online casino games with the biggest payouts are progressive jackpot slots. If you hit the jackpot on one of these slots, you could collect up to $13 million on some games. If you'd prefer to play a casino game where you win less but win more often, it's worth trying out classic table games. That's because the house edge in these games is very low. For example, blackjack has a house edge of only 0.28%; whereas online slots generally have a house edge of 2-10%. When you win at an online casino the money is instantly paid into your account and you will see your balance increase by the amount you've just won. Looking for a casino with great payouts? Stay away from these sites if you want to protect your bankroll! The sites on CardsChat's blacklist are shady establishments famous for long withdrawal waits, refused withdrawals and missing player money. Our expert players advise you to avoid these blacklisted casinos at all costs. A seriously bad bet: OddsPoker is reportedly affiliated to OddsMaker, part of FutureBet. It's faced player embezzlement charges on several occasions. Massive withdrawal waits: Some players have waited over a month for their funds to be paid out!